These women not only start businesses and increase their assets, they also create jobs for others. 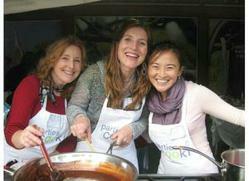 Local culinary events company Parties That Cook® will host Cooking Up Success for Women’s Initiative, a hands-on cooking party fundraiser, on Wednesday, April 18, 2012 at The Ferry Building in San Francisco. Event proceeds go to Women’s Initiative for Self -Employment, a non-profit organization that provides small business training to low-income women so that they can start businesses and become economically self-sufficient. Tickets are $95 per person and $85 dollars of the ticket is tax-deductible. Part cooking class, part cocktail reception, the event atmosphere is light-hearted and upbeat. Guests will enjoy delicious wine provided by Banshee Wines while they mingle and meet new people. A “marketplace” will showcase the wares of five Women’s Initiative graduates. Guests will have a chance to speak with the graduates and hear their entrepreneurial stories. Bibby, Parties That Cook’s founding Executive Chef, will give a lively interactive cooking demonstration before it’s off to the races for each group to prepare their recipes. After 45 minutes of cooking, guests will relax and enjoy the mouthwatering meal they have created – all for a good cause. Near the end of the event, Women’s Initiative graduate, Azalina Eusope, will tell the inspiring story of her experience with Women’s Initiative and how she launched her successful Malaysian foods company, Azalina's. Women’s Initiative Executive Director, Nicole Levine, will share why she has been involved with the organization for over 20 years, and what audience members can do to support the low-income women served by Women’s Initiative. 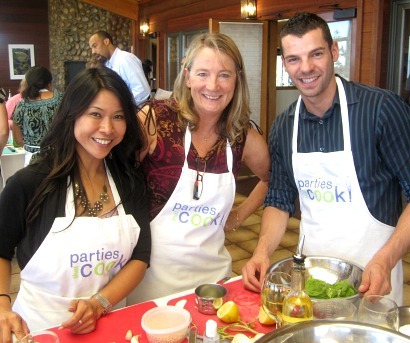 Parties That Cook stages deliciously fun cooking parties and corporate team building activities in private homes and professional kitchens throughout the San Francisco Bay Area, Chicago, Seattle and Portland. Founder and CEO Bibby Gignilliat pioneered the in-home cooking party concept in 1999, and extended the company’s hands-on, interactive culinary events to include a wide array of themed culinary team building events, cooking parties and public cooking classes. http://www.PartiesThatCook.com. Women's Initiative for Self Employment provides high-potential, low-income women with the training, funding and ongoing support to start their own businesses and become financially self-sufficient. The women who go through the program significantly increase their income and assets while launching businesses, creating jobs and stimulating the local economy. In 2011 alone, recent graduates created and retained 5,489 jobs! Women’s Initiative has five offices and 18 training locations throughout the San Francisco Bay Area, and is expanding to Chicago and New York. http://www.WomensInitiative.org.